U2 > News > Dublin, Belfast… U2 Coming Through. 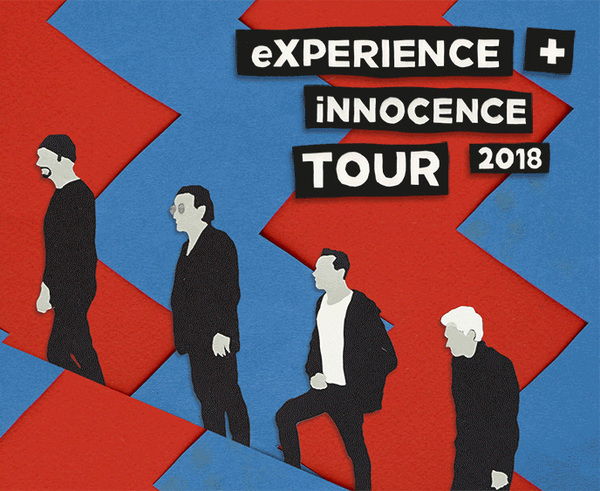 Live Nation and MCD today confirm shows in Dublin and Belfast on the upcoming eXPERIENCE + iNNOCENCE Tour with tickets on sale from this Friday, 2nd February. The band will play at Belfast’s SSE Arena on 27th October and at home in Dublin at the 3Arena on 5th and 6th November. Latest confirmed European cities and dates - and all #U2eiTour dates on our Tours Page. A presale for U2.com subscribers will open tomorrow, Tuesday 29 Jan. (9am), and run until Thursday, 1 Feb. (5pm). All qualifying subscribers will receive an email with their unique ticketing code and may purchase up to two tickets for any one show. Friday’s public sale will have a four ticket limit. All General Admission floor tickets in Dublin and Belfast will be paperless and available online or at the box office only. Please also note that there is no queueing permitted at 3Arena in Dublin prior to 8am due to heavy local construction. eXPERIENCE Group presale start - Tue. Jan. 30 (10am) **NYC, Dublin and Belfast start at 9am. Lisbon presale starts at 3pm.